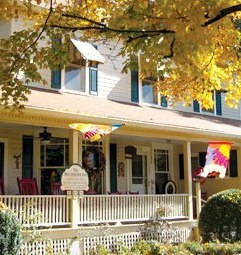 While in search of your perfect place to retire, you might to spend a weekend in this picturesque small town retreat. Known to many as the "front porch" of western North Carolina, Black Mountain, just a short drive from downtown Asheville, offers a quiet getaway nestled in natural beauty for both relaxation revelers and souvenir seekers. For your convenience, we've compiled some of our favorite places to visit, eat, shop and stay in Black Mountain. Although it would be nearly impossible to pack every sight, sound and scene into a three-day suitcase, we tried to hit some highlights. There are a variety of lodging options, including cottages, cabins and campgrounds. For starters, The Red Rocker Inn, which comes highly recommended by The New York Times, is a lovely bed & breakfast named for the quintessential take-a-load-off chair. In addition to true southern hospitality, the Red Rocker also boasts delightful country cottage decor in each room, as well as a hearty menu of what we like to call "comfort food, refined." If you've been dreaming about that romantic weekend in the rustic wilderness, The Cottages at Spring House Farm may appeal to you. Only a 20 minute drive from downtown Black Mountain, these log cabins are secluded and peaceful, with complimentary breakfast food and firewood stocked daily. 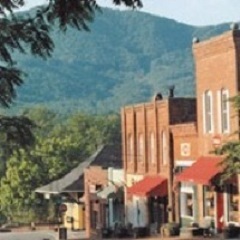 In the spirit of mountain town culture, many of the storefronts in downtown Black Mountain are owned and operated by local artisans, including jewelers, potters, chocolatiers and quilters. Whether your favorite souvenirs are useful or yummy, be sure to check out Town Hardware & General Store for some handmade soaps or visit Chocolate Gems to take home their designer truffles. Before heading back to your quilt-draped beds, take a stroll around Lake Tomahawk. This town has effectively created a pedestrian-friendly environment while preserving the natural habitat for water foul and forest critters. On Saturday morning, after a hearty breakfast at the bed and breakfast, try an invigorating hike or bike ride in the surrounding Blue Ridge Mountains, which abound with breathtaking vistas and a choice of scenic trails ranging from leisurely to strenuous. Following a walk through the woods, replenish your strength with a delicious lunch at the Morning Glory Cafe. And then there's Black Mountain Books for the avid reader or collector. This shop is unique for its rare book collection and also sells handcrafted bookshelves and wooden wares. 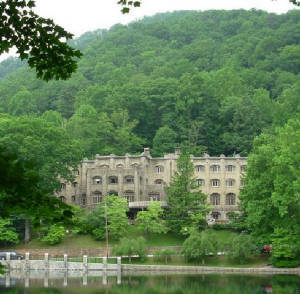 If you're not the outdoors adventurer, take a tour through Montreat. This small township is home to Reverend Billy Graham, and his Presbyterian retreat center. Or schedule a tee time at one of the many golf courses surrounding Black Mountain. Arts and crafts are abundant in this area. So whether you're a window shopper or searching for the perfect gift, don't forget to check out Sourwood Gallery and Seven Sisters Gallery. Both shops feature handcrafted artwork and antiques. 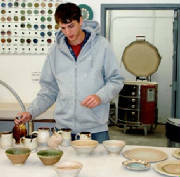 The Black Mountain Center for the Arts also offers a variety of classes and hosts dance ensembles, storytellers and art contests. A good meal is not hard to find in these parts. In downtown Black Mountain alone, you'll find your choice of Mediterranean, Mexican and authentic German food. Several barbeque eateries can also be found in the area, and the recently opened Thai Basil serves delicious curries with real Thai spice. Before your departure from the Blue Ridge Mountains, be sure to stop by The Dripolator Coffeehouse for an award winning cup of coffee. Since 1999, residents of Black Mountain have embraced the coffee shop as a favorite hang out. Patrons have even told owner Amy Vermillion that The Dripolator is the living room to Black Mountain's front porch. In addition to serving gourmet sandwiches and homemade cookies, customers can enjoy the occasional concert or poetry slam. Black Mountain is a pleasant trip throughout the seasons, but if you're looking for art and entertainment, plan a trip around one of the many fairs and festivals in western North Carolina. All in all, Black Mountain is a lovely and relaxing escape from the daily grind. Whether you're searching for peace and quiet or an outdoor adventure, Black Mountain has something for everyone. But don't just take our word for it. 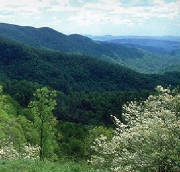 Learn more about Black Mountain and the surrounding area. Who knows...you might even decide that this inviting mountain getaway is your perfect place to retire.